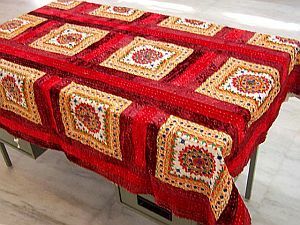 Panpaliya presents Wholesale catalogs of Bohemian Table runners, Hand Block Print Runners, India Table Runners, Mirror work table Runner, Applqiue work Table linen, Silk Table Linen, Embroidered Table Covers, Jaipur Print Table Runners, paisley print table runners and more for retailers & wholesalers, directly from India at discount prices. 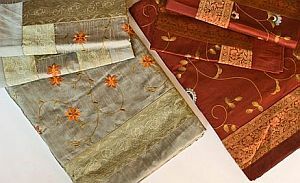 Table runners boast of maximum demand among other accessories in the domestic and foreign markets. The precise reason being their exquisite workmanship and durability. Each piece is a celebration of color and texture, inviting fun and youthful energy to the interiors. 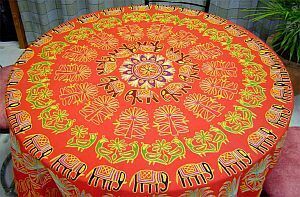 MORE DETAILS:-Beautiful Indian Table Cloth. Beautiful handwork creates an elegant shadow pattern, as translucent layers reveal the all over pattern. The amazing hand weaving technique. 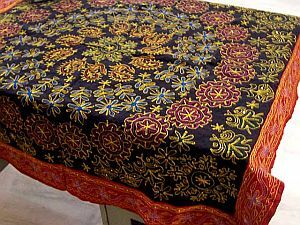 MORE DETAILS:-Tablecloth and napkin set in Silk fabric. 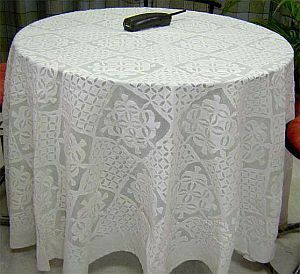 Setting for with tablecloth 60" x 108" and 4 napkins 18" x 18"
MORE DETAILS:- Beautiful Indian Table Cloth. These beautiful linens are handcrafted by women in northwest India. The women carefully cut out the delicate patterns, fold under the edges, and hand stitch the cut pieces onto the base fabric, creating visually stunning, functional works of art. MORE DETAILS:-Table runners boast of maximum demand among other accessories in the domestic and foreign markets. The precise reason being their exquisite workmanship and durability. Each piece is a celebration of color and texture, inviting fun and youthful energy to the interiors.